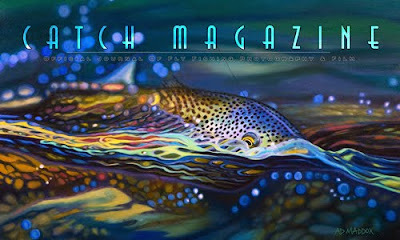 Online Fly Fishing Magazine - CATCH MAGAZINE - Film - Video - Photography: Catch Magazine Issue #44 is Live!!! Catch Magazine Issue #44 is Live!!! Happy Holidays! Enjoy the new edition of Catch Magazine here! Share the Catch Magazine experience. We are searching the world for the best fly fishing photography, film and video. We hope the layout, content and navigation meet and exceed your expectations. While we may not have long articles on fly tying or casting, we will show, via dynamic and creative photography, the beautiful and exciting sport of fly fishing and expose the places, the people, the culture and the soul of this world wide activity. Your comments and contributions are welcome and encouraged. If you are as crazy for this sport as we are, this will hopefully be a long and enjoyable ride.